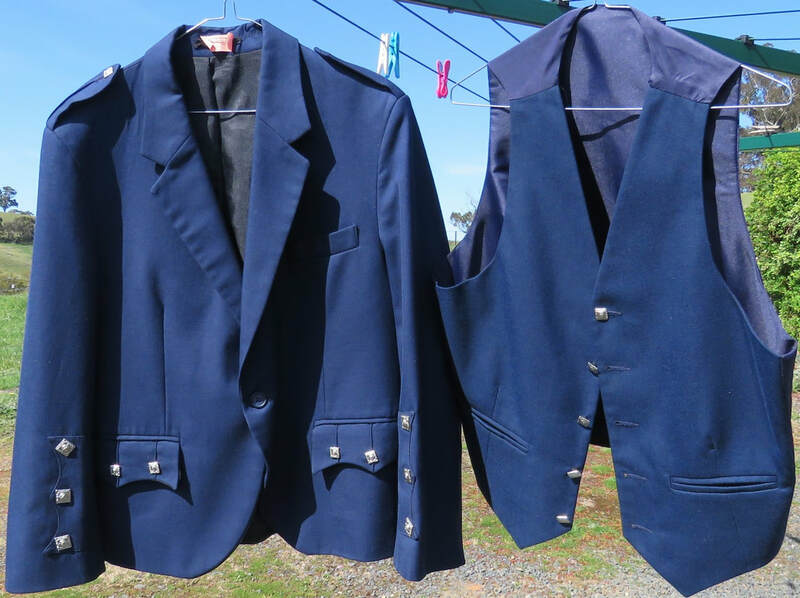 Menswear2; Kilt jackets for sale. Pre-owned ones have been drycleaned. Chest measurements allow 2" / 5cm breathing space. Postage within Australia without extra packaging $10. Postage outside Australia is likely to be too dear. 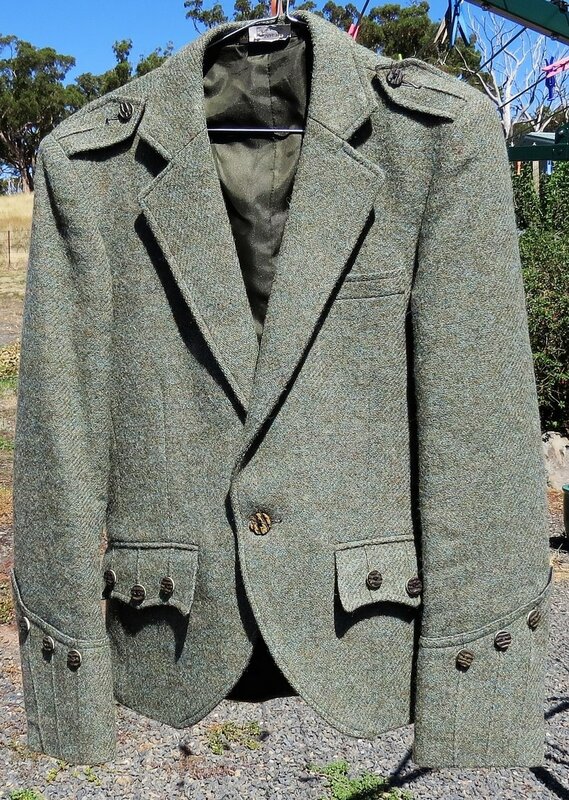 Same style herringbone tweed Argyll jackets. Day or informal wear. $70 each. Geoffrey (Tailor). Jsc7a. Near khaki-green. 35" / 89cm chest, 42cm across back shoulder-tip to shoulder-tip. Jsc7b nearer blue than green. Chest 40" / 102cm, shoulder seam to shoulder seam 48.5cm, underarm seam to end of sleeve 43.5cm. Jsc711. 40"/101cm chest, shoulder width 46cm. Tweed, darker than it appears on my screen. Underarm seam to end of sleeve 46.5cm. New, has spare buttons. 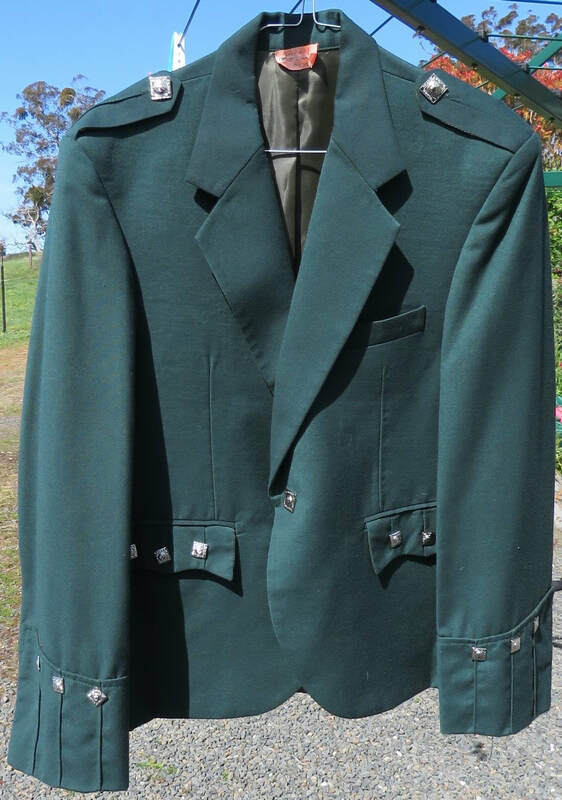 No buttons on pockets - more subtle than some kilt jackets. Aitken & Niven. $75. Jsc 9. Cloth (wool), British racing green. 38" / 96cm chest, 18" /45.5cm from shoulder seam to shoulder seam across back. Underarm seam to end of sleeve 43cm. No label. $70. 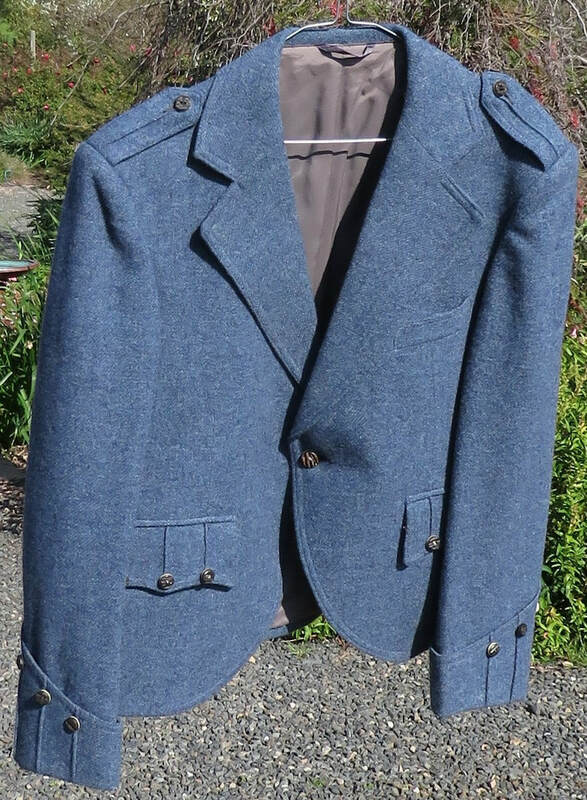 Jsc10, jacket and waistcoat, navy cloth (wool). 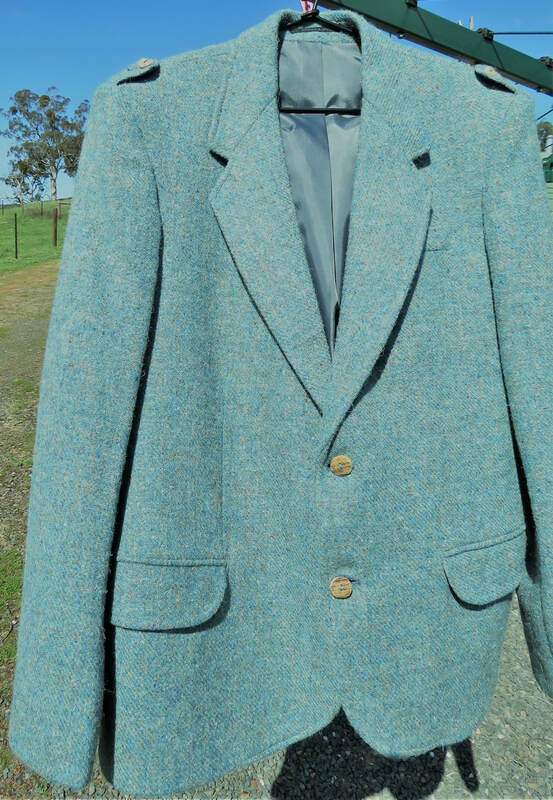 Single button in centre of jacket (will be replaced with one to match the other buttons). Chest 42" /108cm (waistcoat 39), shoulder seam to shoulder seam 45cm. Underarm seam to end of sleeve 40cm. McLeod. $90. 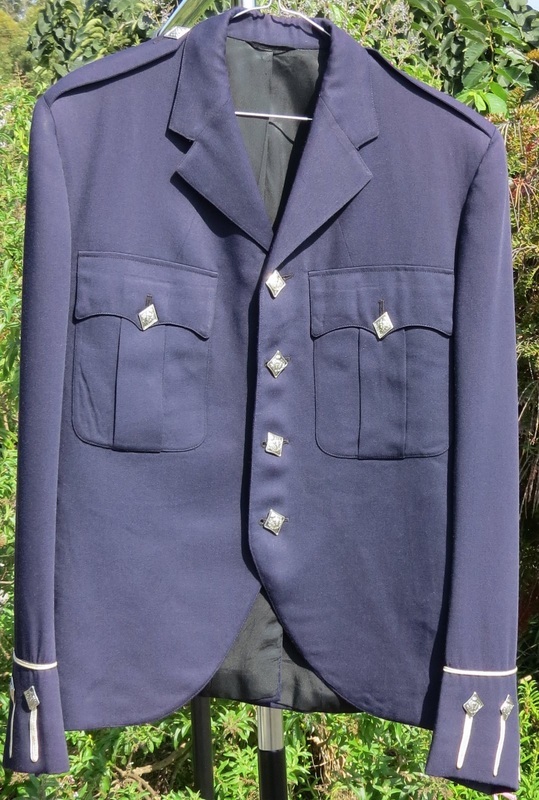 Jsc8 Vintage navy serge piper's jacket, to fit about 38" / 96cm. Argyll-style. Purchase $60 (reduced).